From a young age, Millais showed artistic promise and went on to become one of the most successful artists of his time. His life has been the subject of many screen adaptations including the 2014 film Effie Gray. About the artist: Sir John Everett Millais (1829 – 1896) was an English painter and one of the founders of the Pre-Raphaelite Brotherhood. Considered a child genius, he became the youngest student to enter the Royal Academy Schools at just eleven years of age. The Pre-Raphaelite Brotherhood was founded at his family home in London, then 83 Gower Street. Millais became the most well-known exponent of the Pre-Raphaelite style when his painting Christ in the House of His Parents generated both praise and controversy. Later in life, Millais developed a new, realistic style of painting. These works were hugely successful and made him one of the wealthiest artists of his time. Admirers included fellow artist William Morris. 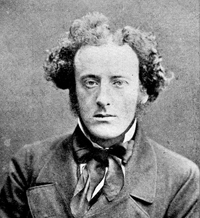 Millais’ personal life played a significant role in his reputation. His wife Effie became a powerful promoter of his work and helped expand his social circles. She was formerly married to the critic John Ruskin, who had supported Millais’ early work. The annulment of Effie’s marriage to Ruskin and her wedding to Millais have sometimes been linked to the artist’s abrupt change of style. Their relationship was the subject of the 2014 film, Effie Gray, written by Emma Thompson.